When designing a new deck and making the necessary landscaping changes to your yard, you may also want to consider adding an outdoor structure at the same time. 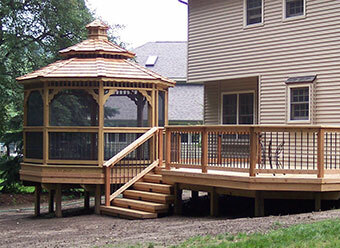 Among the most popular are pergolas, gazebos and sunrooms. Although most of our modern day outdoor structures date back centuries they are more popular than ever because of their simplicity and effectiveness. Deciding which one is right for you takes a little consideration. When your goal is to create shade on your deck or patio, two choices come immediately to the forefront: pergolas and gazebos. Pergolas have been recorded in use as far back as 1400 B.C. in Egypt. For centuries pergolas were essentially open-air archways covered with climbing plants that served both aesthetic and practical purposes. Today pergolas are often found plant free but still providing shade during the hot summer months, and they remain beautiful in design and offer many architectural options. In truth, modern pergola designs are both original and may mimic structures from places like English and Asian gardens. Over and around a hot tub, a pergola lends not only a sense of space, but privacy as well. On a deck or patio, a pergola can provide shade, privacy and help to define an area. For example, a pergola positioned near the cooking/grill area would be the perfect setting for dining. Or a pergola in a quiet corner area away from entrances and exits could be transformed into a wonderful reading nook or space to concentrate on your chess game. In a garden, a pergola can help to create an alternative place where flowers, trees, bushes, and other plants combine with the open structure to provide a peaceful place to relax and rejuvenate. Near a pool, a pergola can provide the perfect shelter for swimmers to get out of the sun and avoid a burn. Everyone loves to sit poolside, so a well-placed pergola allows the best of both worlds. For large open spaces, a pergola can be a focal point and something around which to build a patio, add a fireplace or fire pit and create a “camping-out” feeling — without leaving your own backyard. Like decks, pergolas can be built with wood or using composite materials like Trex®, and are common additions to decks where space permits. Even the most nondescript area of a yard can turn from nothing to something with a pergola, so let your imagination go! Gazebos are also intended to provide shade and a sense of place, however, they do so with an actual shingled roof, rather than a slatted, trellis ceiling like pergolas. In the U.S., gazebos invoke memories of brass bands, ice cream socials and Independence Day, and they are as popular as ever in parks all over the country. In your own yard, a gazebo can be a wonderful place to dine, gather with family and friends, or spend time alone. A gazebo can house a dining table and chairs, a lounge chair or two, or even an artist’s easel. In fact, many of the ideas for pergola use would be perfect for a gazebo too. Most gazebos are built to be permanent structures, although tent-like gazebos are available that can be taken down for winter. Speaking of winter, a gazebo near a frozen pond or lake would provide the perfect shelter for serving hot chocolate to ice skaters and others enjoying a day (literally) on the water. Where pergolas are traditionally arched, square or rectangular, gazebos are round, often octagonal, and may have decorative aspects that match that of the home and/or deck. Others strike a style of their own such as a rustic log cabin, tranquil Japanese garden, elegant Victorian, and more. To really maximize a gazebo, have it built with windows, screens and a door to create a quaint and quiet three-season room, set apart from the bustle of everyday life. Screen room — Essentially a screened-in porch, a screen room provides relief from direct sunlight and bugs, but may not shelter you from heavy rain. Screen rooms are for spring, summer and fall, not winter. Solariums — Like a formal greenhouse, solariums are floor-to-ceiling glass rooms that make use of the “greenhouse effect” and are a great place to enjoy the seasons. Solariums can be designed for three seasons or all four. Three-season rooms — More than a screened-in porch, three-season rooms have glass windows with screens and provide a comfortable living space from the first warm days of spring until winter sets in. Four-season rooms — In general, four-season rooms are fully insulated sunrooms that can be enjoyed year-round. They provide protection from all of the elements in a space that is bright, open and comfortable. And one more option to consider is the use of under-deck space. If you are planning an elevated deck, there may be an area underneath that can be used for additional living space. This will usually require installation of a dry under-deck system that will ensure the area remains free of rain and runoff. This space can then be enclosed or left open to create a wonderful addition to a patio or platform deck and provide protection from light rain and bright sun. All of the above offer privacy, but there are other ways to make your deck private on a smaller scale. Drapes, screens, lattice walls, drop shades, and trees, bushes and climbing plants can also be included in a deck design to ensure your deck makes all your dreams come true! 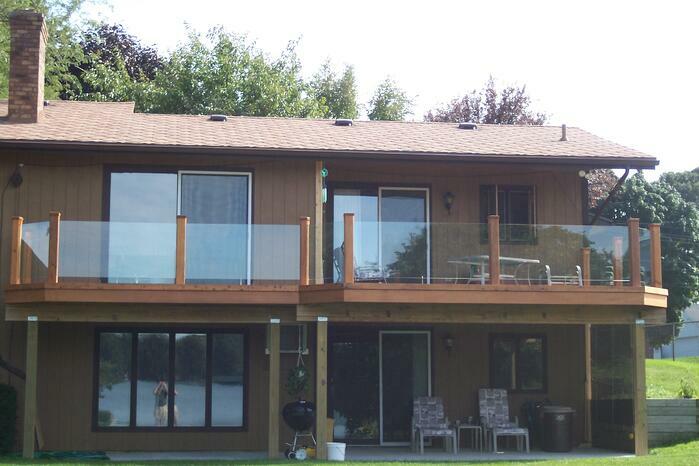 No matter what your deck dreams entail, Custom Built can help you make them a reality. Our clients are very satisfied with their new decks and additions so take a moment to listen to a few of their testimonials. To learn more about designing and building a new deck, see our blog, “Deck Design: Things You Should Consider." Is Trex® the Right Material for Your Deck? © 2018 Custom Built. All Rights Reserved.